This booklet is probably best described as an introduction to the “Law of Attraction”. If this subject is fairly new to you, this book is the place to start. Every day of our lives we witness amazing things. Some events we perceive as enjoyable and others as simply annoying! All events are recorded but our unconscious feeling and our conscious thought often interpret things differently. How We Perform Negative Miracles is all about helping people to realise that we have a big say in creating the life we experience. We can actually produce our own positive miracles and it is so simple! This booklet gives you valuable insight into how. For various reasons, our outlook on life as individuals can often be negative and pessimistic. By this I mean that it is easier to think of what might go wrong, than it is to think of what will go right. How often have we complained that something may not go well for us? Why are we so surprised therefore, when things do not work out? We have actually performed, very successfully, a negative miracle. I am calling these situations ‘negative miracles’ because, by and large, we associate such amazing events as not being conducive to what we would like to happen. We also believe that they arise from outside of ourselves – things that ‘happen to us’ rather than things that we create as a result of our own thoughts and actions. The reason for negative attraction is due to the amount of time and energy we put into thinking about our problems… We do not spend time thinking about what is going right because it is pleasant and therefore not a worry! Because you accept something does not mean you cannot change something. Think in terms of moving more towards something new and not being bound by something that may currently exist. Ask the universe to help you move towards a different experience; one that makes you happier. If you do this with genuine feeling, within only a short time – perhaps days or a few weeks – something will change. “This booklet is an excellent and simple introduction to the complex subject of concious creation. Anyone starting out upon the road of how, ‘you create yourown reality’, will find this a very easy to read introduction. Even people with a deeper understanding may find important insights contained within. I have read most of Jane Roberts, Seth material, books but still gained further understanding from this book”. – P.Deakin, S.Yorks, UK. 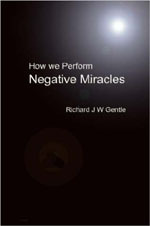 “‘How we perform Negative Miracles’ is concise and cuts to the chase rather than simply filling up space with, most often, voluminous peripheral information and confusing anecdotal examples. Gentle has distilled concepts from books like the “Seth Material” and others with astute personal insights into a ten minute read that can change your life.” – George Glasser, Hoyland Nether, UK.